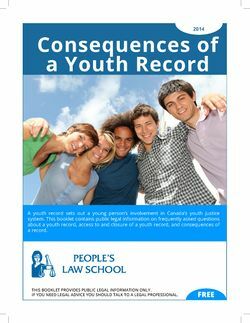 Consequences of a Youth Record from People's Law School sets out a young person’s involvement in Canada’s youth justice system. This wikibook contains public legal information on frequently asked questions about a youth record, access to and closure of a youth record, and consequences of a record. What is a Youth Record? How Long Does a Youth Record Last? The People's Law School is a non-profit charitable society whose purpose is to provide British Columbians with reliable information about their rights and responsibilities under the law. What is a Youth Record? · How Long Does a Youth Record Last? In law, in British Columbia a person under the age of 19. This page was last edited on 27 January 2015, at 12:30.